Hi there! Happy Mother's Day week! It's the time of year when we finally celebrate the women who truly deserve to be celebrated on a daily basis. I'm so excited to be sharing with you a recent styled photoshoot my friend and amazing photographer, Francesca, and I worked on together recently. 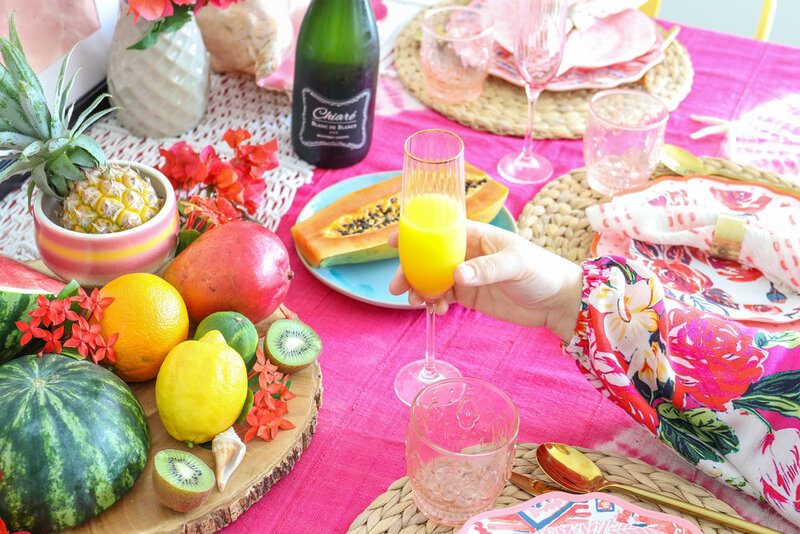 I hope it's all the inspiration you need to throw an equally fabulous brunch for the special ladies in your life this weekend. Maybe it's the move to Miami or perhaps just the constant sunshine, but I have been seriously loving the bright and tropical vibe. 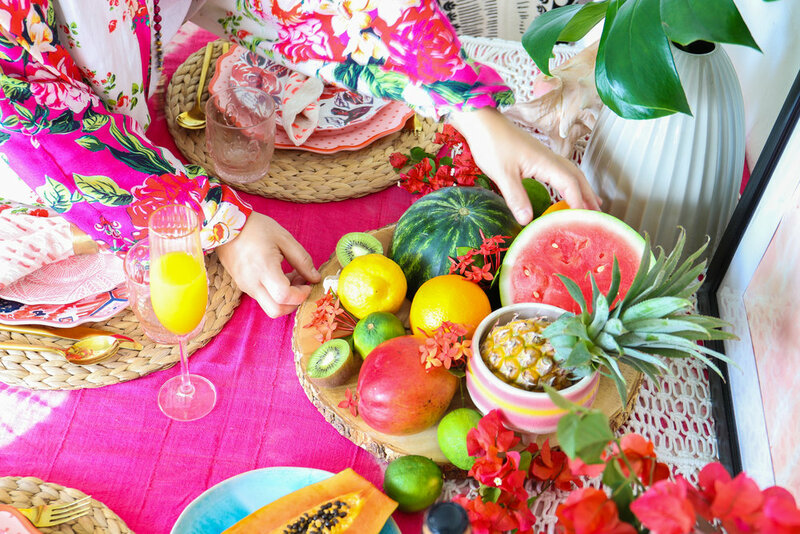 This tablescape is all about brightly colored pattern mixing, layers of texture and tropical flowers and fruits. 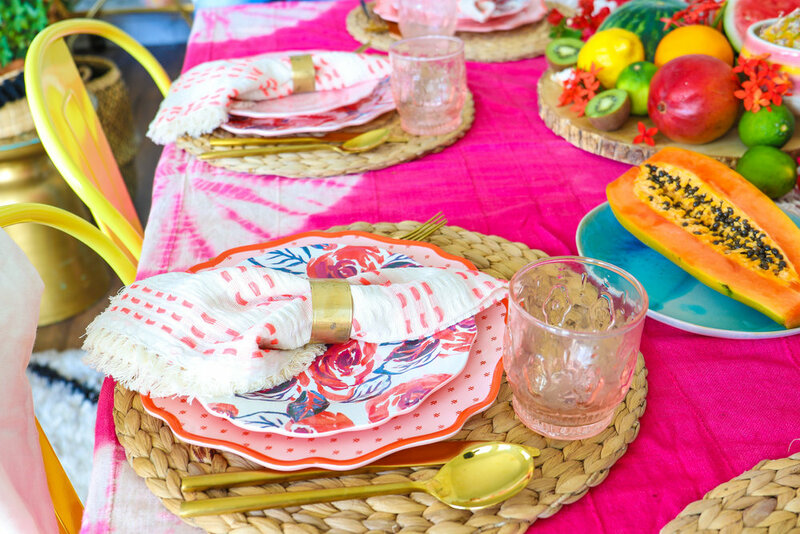 Lest you think that it's outside of your reach to bring this vibe to your home, don't worry, the majority of the items used can be found at your local Target and grocery store. 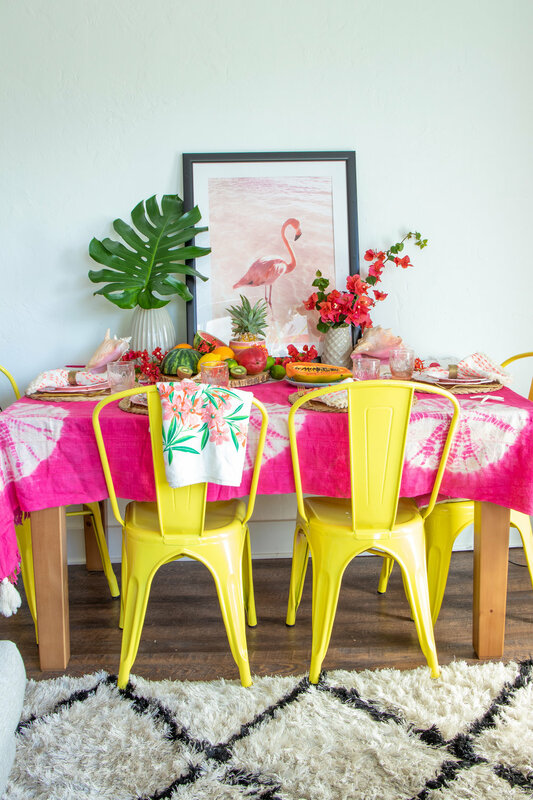 The tropical fruit displayed on the table was really the starting inspiration point for this setup. The organic textures and vibrant hues quite literally jumped off the grocery store shelves at me. It was actually quite simple and inexpensive to create a table centerpiece using these items. I arranged a selection of fruit ranging from watermelons and kiwis to mangoes and lemons on a wooden cutting board (Target). I mainly chose the fruit based on their visual appeal but I'd encourage you to also select fruits that you know your mom and guests will love. Perhaps swapping out some varieties that will be in season near you. I know it's easy to just throw your fruit into a bowl but just taking the extra step to slice a few of the pieces open (i.e. the watermelon, papaya and kiwi) and arrange them on a cutting board provides just a bit more visual interest and makes it that much easier to dig into when the time comes. Next I created place settings that not only mixed patterns but also textures. I am in L-O-V-E with the recent Opal House for Target line and had some fun there a few weeks back. The plates are actually plastic (who knew! ), very economical (ranging from $1.99 to $2.99) and make for a very family friendly table. The glassware are a few treasured finds from Anthropologie. I am such a sucker for pink glassware... swoon!). The champagne flutes (which they still carry here) are rimmed with gold. Just the kind of details to make mom feel like a queen for the day. 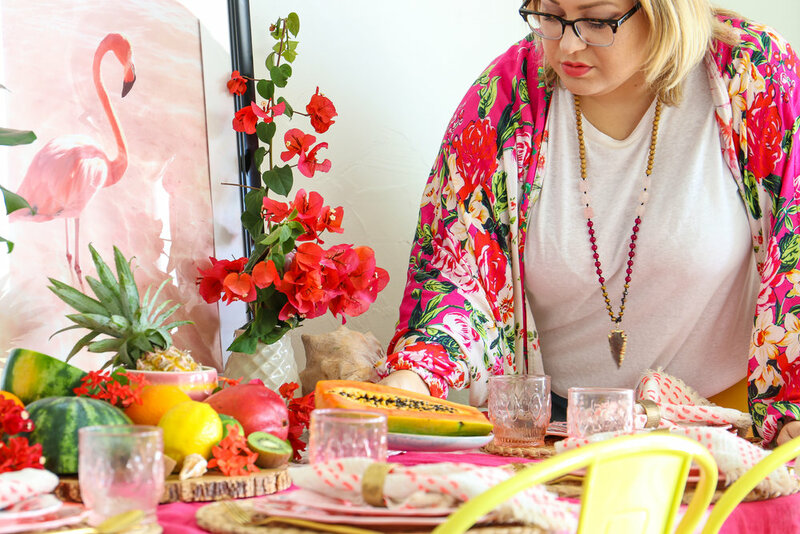 Lastly, I used this fabulous pink, tie dye wall hanging that I found at a local Miami Boutique, Iniva as the backdrop for this beautiful tablescape. That, coupled with the macrame runner also from Opal House for Target and the woven place mats from IKEA gave the table the layered textures it needed for depth. A few sprigs of bougainvillea and a massive leaf from my yard were just the icing on this tropical feast. While you might not be able to run to the yard for some of these items, your local grocery store (especially Whole Foods if you have it) should carry most of the fruits and flowers I listed above. If not, then I'd suggest swapping in a vibrant pink, yellow or orange rose for the floral touch and perhaps some bright berries to round out your fruit display. At the end of the day it really is the thought that will count. I'd encourage you to think about ways to incorporate details that will make it extra special just for your mom. Don't be afraid of mixing colors, patterns and textures. Like in family, the more the merrier! Let's not forget, that setting the table is just setting the scene for the real magic to take place. Don't forget to linger over your time together. Savor the moments just as much as the tropical flavors. Share a favorite story, reminisce about treasured memories, laugh at secret jokes and most of all, don't forget to say THANK YOU. So, here's to all the moms out there. We love you! Happy Mother's Day!